I am calling it quits for now with the Brooklyn Bridge game design. This is the inspiration for this article. So this begs the question: When do you quit on a game design? You might think that would be as easy as asking if the game is any fun. But it’s not that simple. You see, there is this thing called “passion.” A lot of game designers utilize it when create their designs. I know I do. But let’s step back even further and discuss a designer’s philosophy. Why do I design games? Whatever the reason, it’s important that you understand the answer to the question of why you design games. Once you’ve got that figured out, the answer to the first question, when to quit on a game design, can be more easily answered. Often it is important to remove the emotional side of game design before you can truly quit on a design. People put a lot of effort and time and money into their game designs. So to just quit on a design is like throwing all of that effort, time, and money out of the window. Sure, there are usually some takeaways from that design, but ultimately it’s a big loss. Here is the reason I design games: it’s a fun hobby. Therefore, if designing a game stops being fun, I dump it. Why did I Quit on Brooklyn Bridge? I was originally inspired to design a Brooklyn Bridge game when I was watching a BBC documentary about its construction. The discussion about the caissons was fascinating and I immediately had thoughts about a risk vs. reward mechanic built around how long workers would stay in the caisson. Sweet! So I made a time based worker placement game about the Brooklyn Bridge. Workers could get sent to work in several different locations (Caissons, Brickyard, Cableyard, Training Office). Each turn the workers would advance some distance in those locations. The longer they advanced, the better the rewards when they would be removed. This is not dissimilar to riding the gears in Tzolk’in. 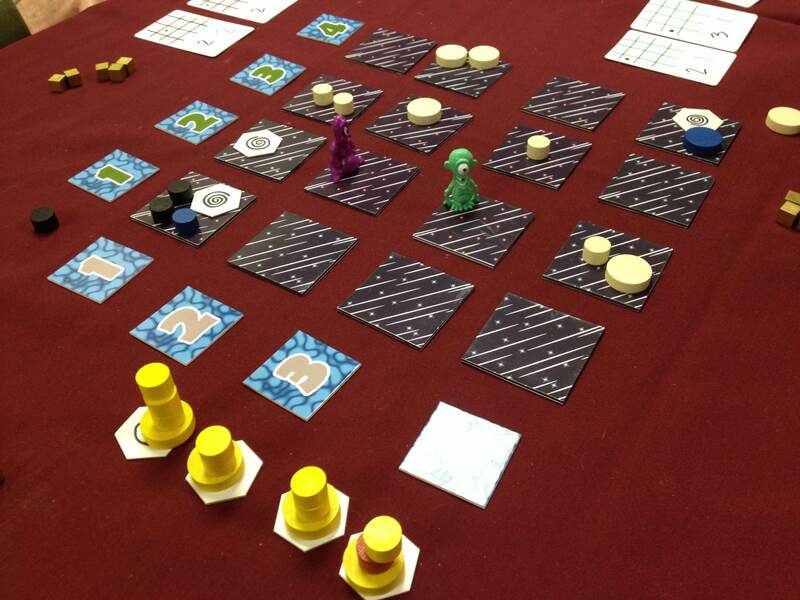 But there was a big change… other players could help you advance even faster if you placed your workers correctly. That’s awesome! That sounds great. But it didn’t work. That’s not to say it couldn’t work. I’m definitely keeping the mechanic for another design. It just didn’t all work for this design. The game took too long. It felt same-y (meaning there wasn’t enough variability/replayability). And ultimately the decisions you made throughout the game didn’t get more tense or more interesting. That’s not good. I got through about 15 playtests and after the final one I realized I just wasn’t enjoying working on this design. It was at that point that I detached emotionally from the game and felt at peace to let it go. I quit on the design. I believe it has potential. I believe that are good elements in there. If a publisher wants it and is willing to develop it I would happily work with them. But I quit because I was no longer enjoying it. Why do You Quit on your Game Designs? I urge you to go back to my question of “Why Do You Design Games?”. Knowing the answer to that can greatly help you know when to quit on a design. Most designs won’t succeed. As a designer it’s important to know when to give up on one and start on the next. If you spend too long on a design that doesn’t have a future or that isn’t enjoyable or that is unpublishable then maybe you should consider breaking up with the game. I’ve met a whole bunch of designers with tons of games that never made it. Some have been working on the same games for years. Others have thrown away games that are only a few days old. There is a level of recognition where they realized the game wasn’t worth it. The sooner you can realize that a game isn’t deserving of your time, the sooner you can design one that is! Another week gone by. And another summer weekend in the rear view mirror. And another tornado warning where I live. What a summer this shall be! It’s Monday, so let’s take a look at the Boards & Barley that I enjoyed this past week. This is a beautifully tasteful beer and perfect for warm summer evening enjoyment. Lake Louie, a local brewer, makes some excellent brews. This particular beer, a “California Common,” is Lake Louie’s first lager beer. It weighs in at 5.8% abv and possesses 30 IBUs. And it is really tasty! What brews have you been enjoying? It worked really well, increased player interaction dramatically, added a slightly more cut-throat nature, and most importantly made it more fun and enjoyable. I can’t wait to get it to the table again and keep working on it! The only other game I played last week was Mutiny, which I should be able to write about in the near future. I’ll keep you posted on that. What board games have you been enjoying? Yes. My Wisconsin Badgers are in the Final Four! What more could I ask for? This isn’t a sports blog so I’ll spare you the awesome details, just be aware that I’m excited about that. This is, however, a blog about beer and board games. And each Monday I share a recap of the Boards & Barley that I enjoyed the previous week. So I welcome you here to see what I enjoyed. If you enjoyed something special, please feel free to comment below! I’m not an IPA guy. I’m not a hoppy guy. But I’m sick of sharing those two disclaimers. So by golly I’m gonna start enjoying these types of beers. There are so many of them out there that I don’t want to exclude them any longer. So I started this new escapade with the Redhook IPA at a recent board game night. I was pleased by the lack of over-the-top hops. It was bitter, but not unacceptably floral. So I’d say I would enjoy this again. I’m excited to be branching out into a new realm of beer. I’m sure I won’t enjoy them all, but at least I’m diving in! NEW! Next Door Brewing Wilbur! – I finally made it to local Next Door Brewing. I chose their Wilbur! beer and it was pretty good. I’m not sure why Quantum Orcas still exists. It’s probably because it only takes 10-15 minutes to play and has a quirky theme. No matter the reason, it is still around and it keeps getting better. I’ll give more details below, but Quantum Orcas has gone beyond “pet project,” as a good friend mentioned, and it’s now a legit game design. I’m pretty excited about that. PROTOTYPE: Scrapyard – This was a neat two-player game where players try to build the best upgraded robot. I really enjoyed the mechanic and I think there is a sweet design inside this concept. As I mentioned above I’ve kept working on Quantum Orcas. The biggest change I recently made was to change it to allow for 4 players. Previously it was only a two player game. Ultimately there is no good reason for this not to be playable up to 4. So I designed decks of cards for each player and had my first ever 4 player playtest. It worked pretty well. I don’t think people were in love with the game, but the changes I implemented made it quite a bit better. Another thing I changed was how the asteroids move through space. (Timeout… I thought this was a game about killer whales eating boats? What’s the deal? Well I changed it based on feedback and now you are an orca in space eating asteroids. That’s the deal!) Previously small asteroids would move toward the upper left corner of the 4×4 grid and large asteroids would move to the lower right corner. This caused a large pile of small asteroids in the 1, 1 spot. And players just didn’t think that helped to make it fun. Now small asteroids move up on the board and large move down. They both follow the star lines on the tiles on the board. This seemed to work quite well without increasing the fiddliness. These show the placement of new asteroids and the Quantum Blowhole for each round. The other change is that I now have an Asteroid Deck. The card example shown above has already changed after I received a suggestion of having the rows be labeled A through D instead of numbers. I originally had numbers in two colors because you would have to roll two d4s for each asteroid that you were to place. That was the fiddly part. Now there are 16 cards for seeding, 8 of which are used in a game of Quantum Orcas. These cards help speed up the game a lot! The other game you might have heard me talking about is Brooklyn Bridge. I love this game. It has a unique time-based worker placement mechanic that has received awesome feedback. People really seem to love it. The biggest issue with the game currently is that it takes too long. I recently received feedback that will help me cut that quite a bit. I am actively making changes and trying to cycle through playtests with this game. I think there is a lot of potential here and my plan is to have 30 playtests completed and have a refined game by GenCon. I also came up with a new game design based on a conversation with a co-worker. I don’t want to share any info yet, but I think it could potentially be a really amazing game. The only detail I’ll share is that it would have a space/sci-fi theme. So those are the Boards & Barley and game design efforts I enjoyed this past week. What did you enjoy?! Over the weekend I had the pleasure of playing a bunch of game design prototypes as I was attending Protospiel-Milwaukee. Since they were unpublished prototypes I’m not going to share my opinions about them. If you want my opinion, ask me privately. For those who do not know, Protospiels are game designer conventions. The idea behind them is that you can get feedback on your game designs from other designers, who are likely to see the game differently than gamers in general. It is a fantastic event for aspiring and successful designers alike if for nothing else than networking. I met a bunch of new people, hung out with some old friends, and got my newest design, Brooklyn Bridge, to the table for it’s 4th playtest ever. Overall it was a great weekend and I can now make both Brooklyn Bridge and Quantum Orcas even better. Sometimes it is worthwhile to put the spotlight on things because they are not good. This beer was very interesting. First, if you are going to make a seasonal beer that is light for Spring, why make it Imperial? Second, why make a Maibock that doesn’t taste like a Maibock? I typically enjoy drinking a Maibock because it makes me think of Spring and melting snow and blossoming flowers. This beer didn’t have the Maibock characteristics that made me think of those things. I got the chance to play Kane Klenko’s Mad City by Mayfair Games last Saturday and I forgot to add it to last Week’s Monday Brews. Fortunately I was able to play it again at Protospiel so I am placing it in the Boards Spotlight this week. In Mad City you are building a city of residential, industrial, and urban areas. To score the most points you will want to put those areas near each other. So you should build larges groups of residences or large groups of industry. No one wants their house next to an industry. So the larger the groups you can make, the more you can score. I won’t get into the game any more than that for now, but you can look forward to a review of Mad City on Friday. Quantum Orcas in space. Plastic monsters work too. Quantum Orcas – this was requested by several different people who wanted to play it. So I think it was played 4 or 5 times at Protospiel. I love those farmer meeples! 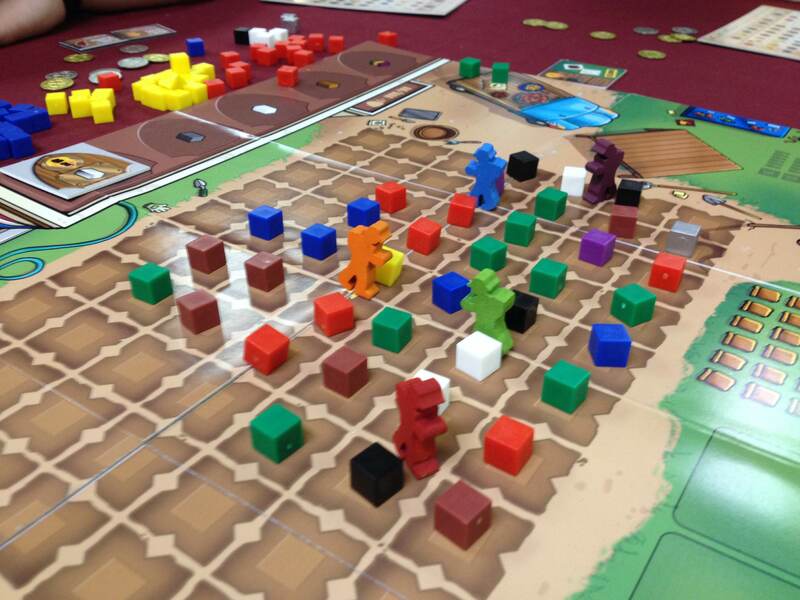 Scoville – I got to play this with the honorable Ryan Metzler of The Dice Tower and a very nice respresentative from AEG. It was fun to play with the farmer meeples that TMG sent me. I lost, but so did Metzler. Sequoia Grove – my failure of an entry for Dice Hate Me Games’ 54 Card Challenge. But I think I have an interesting mechanic in the game though Metzler would disagree. Backyard Astronaut – designed by Adam Buckingham. I’ve mentioned this one before. He got a bunch of playtests and people enjoyed the game! Don’t worry… it’s different already! 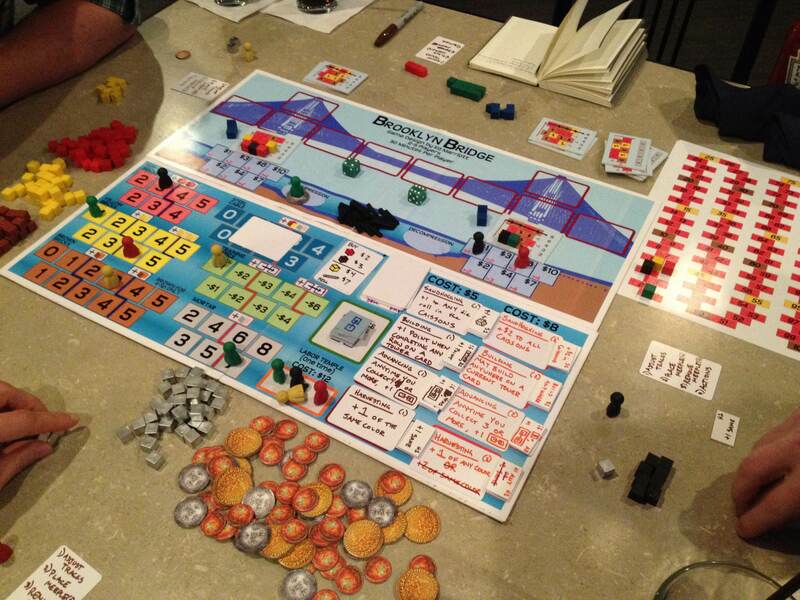 Brooklyn Bridge x2 – After a playtest with my Level 1s I made some changes and it worked much better at Protospiel. I got some good feedback and I am now equipped to make this game great. Those are the games I played last week. It is fun to play a bunch of prototypes and see what other people are working on. It was also fun to do some networking and meet other great people in the game design industry. It’s worth going to things like Protospiel for that alone! With my attendance at Protospiel I had prepared Version 4 of Brooklyn Bridge in the hopes of playtesting it with other designers. After Playtest #3 last week with my Level 1s I knew I had to adjust things before putting it in front of other designers. So I made a new version (seen in the picture of Brooklyn Bridge above) and tweaked a bunch of stuff. The result was a much quicker gameplay that finished with scores much more aligned with what I would want final scores to be. The game at this point works and has interesting decisions. It still needs to be streamlined slightly. I have a path forward in that regard. Also, I now have a good idea of how I want to separate in-game scoring from end-game scoring so that even if you are behind you still have hope that you can finish with the victory. So there are a lot of good things going on with Brooklyn Bridge. I also got Quantum Orcas to the table four or five times. I don’t think the game is very good, but several people wanted to play it. Fortunately it plays in 10-15 minutes, so the players didn’t suffer for too long. I got a bunch of feedback that was all over the map for Quantum Orcas. But perhaps the best thing to come out of Protospiel for the game is that I now have a good way to break ties. I’ll keep testing this one and see if I can make it as awesome as its title. Thanks to everyone who played my games over the weekend. I had a lot of fun teaching them and watching you play them. So those are the Boards & Barley I enjoyed last week. Did you try anything new that you thought was special?